While some say chess is an art (as well as a science), we tend not to treat it that way. Most players don't just look at a position and think to themselves "that's nice", but instead immediately launch into a "if white plays here" kind of analysis. But sometimes there are games where you just have to appreciate how the pieces are arranged on the board. 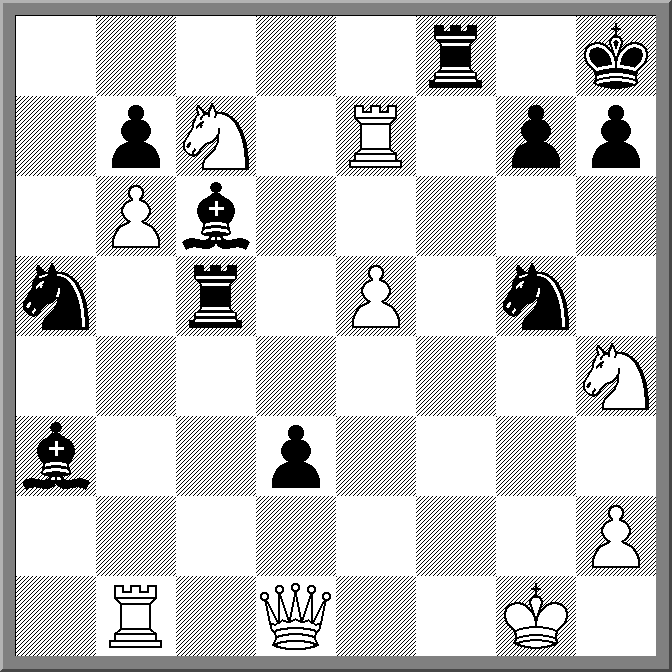 An example of this is the Karpov - Kasparov game from the 1993 Linares tournament. If you play through the game below, make sure you stop at move 22 (22. Nc1) to appreciate what Kasparov did to Karpov. It looks like Karpov had started with his back rank shuffled, and I assume Kasparov took great delight in his position. But once you have enjoyed the static nature of the position, keep clicking to see the dynamic finish that Kasparov found. Here is a cute study I found in 'Secrets of Spectacular Chess' by Levitt and Friedgood. Although I already have a second hand copy of this highly regarded book, I managed to pick up a new copy for $10 today. I figured a second copy at that price wouldn't hurt, as I may lend it to one of my enthusiastic students, to introduce them to the beauty of chess studies. 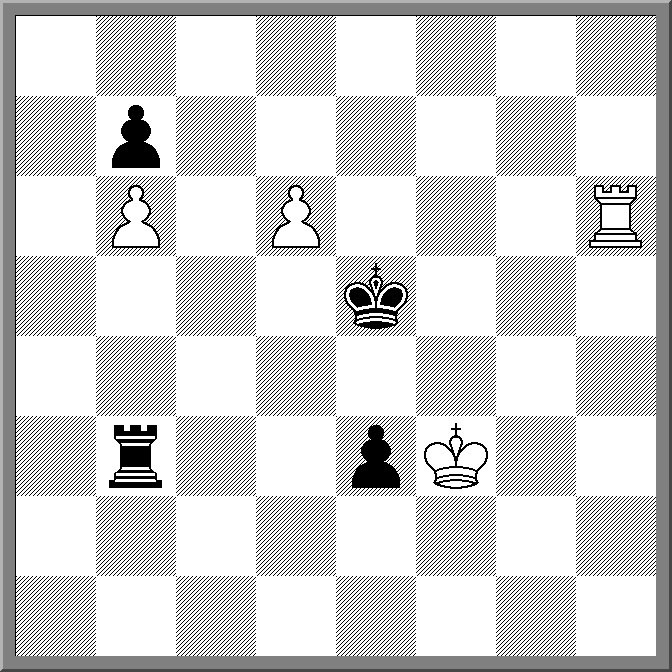 As for this study (by Rinck) it is White to play and win. Clearly there are some clues in the initial position about what the ensuing play is likely to be, but if you need a further clue, then look to the headline. Two important events began today, providing some much needed late night chess watching for the next two weeks. The 2016 Asian Individual Championship is being held in Tashkent, with the first round starting earlier this evening. There are 91 players playing, although with 28 GM's and 13 IM's it is hardly the tournament for chess 'tourists'. There are no Australian players in this event, but Rebecca Stones is playing in the Women's tournament, and Stephen Lukey (NZ) is flying the Oceania flag. Also kicking off is the 3rd Gashimov Memorial event in Shamkir. Top seeds are Caruana, Giri and Karjakin. Of major interest is how Karjakin performs in the lead up to his World Championship Match, while Hou Yifan has a chance to put the issues of the Women's World Championship behind her. The great thing about being a kibitzer is that you only have to be right once. While the two players in front of you have to make sure every move is accurate, you can toss around bizarre suggestions like election promises, knowing that if your wrong no one will remember, but if you are right, then you are a genius. This is especially common in tactical games, where the old adage about sacrificing other peoples pieces is doubly true. As my point needs an example, I've dug up an old CC game I played. Ignoring the fact that there weren't any spectators in a real sense, I could just imagine the virtual spectators calling for the sacrifice on f2. It turns out that if my opponent has just moved the king to f1 then more work was needed, but once he took on f2 I, and any potential kibitzer, was on the fast road to victory. A few days ago I saw a kick starter campaign for a chess set that did not need setting up. Or at least that's what the claim seemed to be. Now normally I'm a fan of interesting and/or inventive sets but this idea did not quite make sense to me. Based on the video at the link you simply tipped the box upside down onto the table, lifting it up to reveal a ready to play set. Simple and effective. But looking behind the curtain it seemed at the end of the game you needed to replace all the pieces in storage holes inside the box, in the correct order, and then place the board over the top. So my first (and possibly only thought) is: Isn't this just the same amount of effort that you need to set up a board normally (if not more)? I saw at least one other person discuss this product, suggesting it might be useful for film directors to make sure the board is set up correctly (yes Captain America). However as the board seems to be a perfect square, I'm sure the odds of the bottom right hand corner being a dark square will remain above 50% in film, television and print, and may even push that number hight, rather than lower.. The 2016 NSW Open is being held on the weekend of the 11,12,13 of June. Once again it will be held at the Chatswood Club, which is just a short walk from the Chatswood Railway Station. The evtn will be split into 2 sections, with an Open section, plus an Under 1600 (ACF) section. The Open section will be FIDE rated and has a first prize of $1400 (and a prize pool of $5000). The Under 1600 event is offering a first prize of $1000 and has a generous minor prizes. 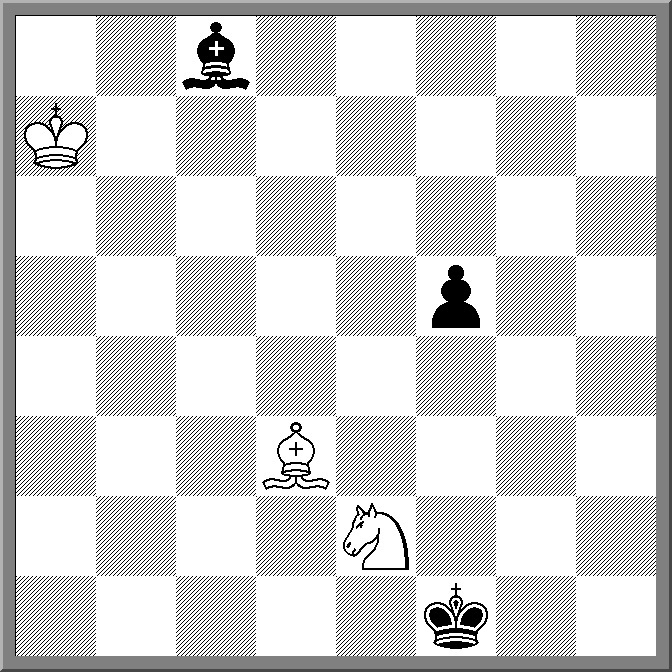 Here is a somewhat strange chess puzzle. It is White to play but Black to win. The question is why? And as an additional challenge, can you name some of the pieces? This game is a kind of follow up to last weeks game at the ANU Chess Club. It was the same opening at the start (Closed Sicilian) although I played it a little more flexibly this time. For a while I was toying with the idea of landing a piece on f5, but this was both unsound and unnecessary. Instead I just kept the position under control and took advantage of the opportunities as they arose. The key moment was when I was able to play 29.g5, although 29.Rxf6! was even stronger, as g5 then wins back the rook due to the pin after Qxe5. After that it was just a matter of eliminating pieces, avoiding tricks, and finally finding the forced mate at the end. Every now and then you get an ending which is not easy but at the same time has a fairly short solution. Often it comes down to recognising the right idea, although this can be difficult after a long game. I recently saw an example of this, as shown in the diagram. White had just pushed the pawn to d6, setting a big trap. If Black captures on b6 then d7 is winning, although the QvR ending after Rxh6 d8=Q can be hard to win. However there is a far simpler line in this position starting with 1. ... Rd3. For some reason this did not seem obvious to me at the time, possibly because I was moving the rook towards the White King did not occur to me. But once I did see it, all the other complicated lines just fell away. Ah. Classic click bait! This isn't a story about playing chess while stoned, but something far more interesting than that. Two climbers, Jost Kobusch and Nadav Ben-Yehuda are claiming a world record for playing a game at an altitude of 8,000m The game was played just below the summit of Annapurna, an 8,091m high Himalayan peak. By necessity the game was played quite quickly ( 7 minutes in total) due to the very thin atmosphere. This also had an effect on the quality of play, with both players problem solving abilities impaired by a lack of oxygen. The other unusual fact was the game was played on a smart phone, as I assume there was no room for a full sized chess board among the climbing equipment. The full story of the game, and the climb, can be found here. The 2016 European Championship is currently underway, with just over 100 GM's playing in the 245 player field. As with recent editions of this event, there are a few 2700+ players (5 this year) followed by a larger bunch of 2600+ GM's (another 55). For some players (at the top), it is about winning the title and prize money, but for the larger group, just grabbing a World Cup qualifying spot is the aim. At this stage 3 rounds have been players, and there is still a large group on a perfect score. I would normally point you at the organisers page for further info, and while it is a very nice website, it lacks the one thing that makes it truly useful, content. So instead, hit chess-results.com for the results, and chess24.com for the live game coverage. Karl Galli is a long time Canberra chess player, who is well known for his particular choice of opening. He favours a hyper-hedgehog type system (both as Black and White), where he pushes most of his pawns to the third rank. and invites his opponents to take all the space beyond that. Normally this would be suicidal, but the extra wrinkle is that he tries to meet each pawn push with a corresponding push on an adjacent file, trying to keep the position closed. This also prevents the opening of files, often blunting any attacking ideas that normally come from having extra space. It can be a very effective systems, as the lack of open lines can frustrate his opponents into over pressing and blundering. I have lost at least once to this system (back in 1993) where the game basically followed the above script. 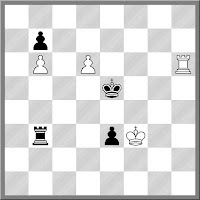 I kept trying to open the position on the kingside, but did not succeed in doing so in an effective manner. Karl however did open up the queenside, allowing his heavy pieces to get into my position. Despite all this, I was still winning for most of the game, until a few moves before the end (maybe I was in time trouble), where I blundered in a bishop ending and resigned a couple of moves later. When I first played the chess Olympiad (in 2000), it was a 14 round event, with teams of 6 players. Over the years the Olympiad has gotten shorter (and smaller). The rounds dropped from 14, to 13 then to 11. The size of the teams dropped from 6 to 5 (in the Open), although the number of boards playing remained at 4. As compensation the size of the Women's teams went from 4 to 5, although not every country sends a women's team (although on occasion some countries only send a women's team). For this year what's getting chopped is the number of rest days, from 2 to 1. Previously the format had been 5 rounds, rest, 5 rounds, rest, final round. I assume that instead it will be 6 rounds, rest, 5 rounds. Obviously this is to reduce the costs of the organisers, who are on the hook for players accommodation. And as a player I would not be that fussed, as my primary focus if I am in a team is playing chess (although if I was a professional I might be more concerned). But as with previous changes of this nature, it is part of a trend to reduce the cost of holding chess Olympiads as much as possible. Maybe the previous suggestion from within FIDE of a two tier, 2 round a day, 1 week Olympiad isn't that far off. I played quite an enjoyable club game this evening, although the ending was marred by some laziness on my part. To be fair to my opponent, it was actually equal until he chose Kh6 on move 36, although he may have missed 40.Kc3. So when all was said and done I was up a rook, but he did have three connected passed pawns. Of course at this stage I should be doing the hard thinking, but not seeing a clear winning plan, I took the lazy way out. Surprisingly Bxe4 was the right idea, but I didn't bother to follow up 47.fxe with 48.Rf5+ then Rf1 (or anything other than the fancy Rxe4+). Instead I created a 'cute' draw, which while nice, isn't as valuable as a win. To me chess has always been a stressful game. Every move brings me closer to victory or defeat and often I don't know which one will happen first. As a result I often have to motivate myself just to get to the board. So I was a little surprised to find that not everyone thinks this way. A couple of chess playing friends of mine believe that chess is the cure to stress. When they sit down and play, that's all they occupy their mind with, removing any worries and concerns about the outside world. And while they take their chess seriously, it is a different kind of seriousness. So maybe that's what I've been doing wrong. Instead of concentrating on scoring points and boosting my rating, I should instead focussing on the meditative aspects of the game. At a lot of junior chess clubs I see different chess sets including Marvel sets, Harry Potter sets, and Star Wars sets. The Star Wars set is quite popular with the kids (and a special treat for the best behaved), but know I have read about an even better Star Wars set. Instead of using the characters from the movies, this set is model on the holographic set that was shown in the original movie. If I read it right, the set will use VR technology to make it appear as it did in the movie, with PvP supported so you can play opponents over the net. At this stage the project is looking for some kickstarter scratch, and has around a month to raise the remaining $85,000 to make it a (virtual) reality. The recent game from the Russian Teams Championship between Peter Svidler and Ian Neponiachtchi seems to have set some sort of new record. On move 40 Svidler player Kxf4 leaving only the 2 kings on the board. Technically the game should have stopped on move 39 after Nepo played Kxc7 (there is no mate possible after this), but I suspect Svidlers move came before an arbiter could step in. The record in question is the shortest game to end this way. Now this game isn't the shortest, but it is one of the shortest. The shortest game to end with KvK was only 17 moves, but this was clearly a collaboration between the two players ( Haimovich and Zifroni). The next shortest game (in my database) is 35 moves, one of 10 that finish before move 40. However the players in these games were either unrated or lower rated, but of course a game is still a game. Therefore the Svidler Nepo game might not be the shortest KvK game, but it is certainly the shortest GM game to end this way. The nearest rival looks to be a 43 move game, and unless there is some implicit collusion in the future, this may be a record that stands for quite a while. Yesterday saw an absolute cracker of a game between Alexi Shirov and Sam Sevian. Playing a slightly unusual line of the Scotch, Shirov followed his patented plan of seeing which side of the board his opponent puts his king and then throwing all his pieces at it. The fun started with a rook sacrifice on g7, and it looked like it was to be another brilliant win to Shirov. However two can play that game and Sevian decided to follow the same script, sacrificing his rook on b2 after Shirov castled queenside. All things being equal (ie you sac, I sac), the game should have remained equal (37.Qe7+), but Shirov decided to push for more, and Sevian pounced. After 37.Nb5, Sevian reeled off 010 checks in a row, and Shirov was forced to resign a move before mate. In last nights club game, I had the chance to sacrifice my queen on d1 early in the game, in return for a check on b5 and the start of an attack. It turns out the sacrifice was overly hopeful (ie unsound) and as a result I chose not to play it. However there have been plenty of examples where it has worked, and it is a useful idea to know. The basic idea is to capture on e5 with a knight pinned by the bishop on g4, allowing the queen on d1 to be captured (an idea also seen in Legals mate). The f1 bishop then checks on b5, and if all goes to plan, White recoups the surrender queen with interest. 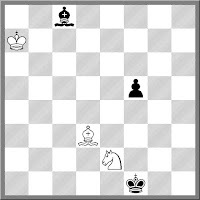 However the example I have chosen to show, does not end in a win for white, but only a draw. However it is still of interest as it shows the basic idea, and was played between to exceptionally strong players. Due to a scheduling conflict I seem to have missed my chance to play in the 'Stoned World Chess Championship'. It was being held as part of the Mardi Grass festival held in Nimbin, New South Wales. I'm not sure what the tournament rules were, but I'm pretty sure that the FIDE drug testing policy was not in effect, and that the eating at the board rule was pretty relaxed. No results from the tournament at this stage either, but I'm sure the organisers will be sending them out shortly. Street Chess took an excursion over the border today, playing a rare Sunday event in the village of Michelago. When I woke up this morning the weather looked quite worrying, but as I got closer to the venue, the skies had cleared considerably. However the wind was up and the original plan of playing out in the open was quickly abandoned as we were spending more time chasing boards and pieces. Heading for cover, a modest 6 player round robin was organised. While the size of the field was small, it did attract a large number of curious onlookers. Going into the final round Lee Forace and Therese Tran shared the lead on 3.5/4, but a combination of fortunate results allowed be to finish in front on 4. My last round game against Lee was particularly interesting (and tragic for Lee), as the Nxe4 line of the Scotch Four Knights resulted in my King going for a walk into the middle of the board. The 'Iron King' (as it is sometimes known) managed to survive the worst of it, and as the pieces came off, came into its own. By the time an ending was reached it had taken up more normal duties, so much so that the game was over soon after. Three big events all finished within days of each other, with wins for three of the biggest names in world chess (and a third placing for probably *the* biggest). Fabiano Caruna won the US Championship at his first attempt, scoring 8.5/11 and finishing a full point ahead of Hikaru Nakamura and Wesley So. These 3 players then went on to play in the 'Ultimate Blitz Challenge', along with Gary Kasparov, in a $50,000 18 round event. Nakamura emerged victorious after 2 days play with 11/18, ahead of So on 10. Kasparov finished strongly to score 9.5, while Caruana struggled throughout, ending with 5.5. To indicate how long it has been since Kasparov had retired from full time chess, this apparently was the first time he had played any of these players in a competitive game. Over in Norway, Magnus Carlsen has won the Norway Chess Classic for the first time. He finished on 6/9, ahead of Lev Aronian on 5.5. As with events of this nature there were a significant number of drawn games, but Carlsen provided the entertainment factor with with 4 wins (and a loss to Aronian), while Nils Grandelius and Pavel Eljanov contributed at the other end of the table, being beaten up by a lot of the field.